Matchmaker, matchmaker, make me a match….but what’s the catch?? Today’s lesson didn’t come from the gym, although it was another conversation I overheard this week. Ann knew Bob was looking for an opportunity just like this. Ann listed the reasons why this might be just what he was looking for–the price, the time, the location, the trade-offs. Bob listened enthusiastically. Ann also knows a lot about Bob–his strengths (and weaknesses), his habits, his way of doing things. So, although Bob was saying “yes”, she asked him an unusual question before taking the matter any further. Bob quickly replied, “Nine!” and that’s the last of the conversation I heard. I had to get back to my studio. Ann’s question stayed with me. Obviously, she didn’t want to go out on a limb to introduce the opportunity-holder to Bob. If Bob is truly eager to act, it will benefit all three of them. But if Bob isn’t really interested, it will be lose-lose-lose, a waste of time and energy for everyone involved. “On a scale of one-to-ten….” What a wonderful, non-confrontational question to ask, to qualify the ‘buyer’. How many times have we been in situations like this, acting as the agent of change for someone else? For the sake of clarity, let’s continue this as us trying to do something for someone else. But picture it the other way, too–someone trying to do something for us. We recommend a gallery to a fellow artist. Or we think a friend might like another artist’s work, and urge the artist to contact that friend. Or we think we know the perfect space for someone who says they need a studio. A customer is waxing enthusiastic about our artwork, and we want to get it into their hands/home/heart. In every case, we see ourselves as ‘helping’ someone out, doing them a favor out of the goodness of our heart. We’re simply giving them what they want, right? We’re trying to match up their need with the right opportunity. Sometimes, it is a simple thing. That space really is perfect for them, they really are looking for that opportunity, they really do want that painting–and the matchmaking is complete. Often, however, there are reasons why it just won’t work for that person. The cost might be out of their range. They’re actually not ready to take that step. They’re just not into doing anymore shows, right now, or not interested in doing the gallery thing. In fact, more often that not, what people say is holding them back, isn’t. Either they’re not ready to say why, or they just don’t know. Whatever the reason, without us knowing what they’re really thinking, this might result in us giving even stronger encouragement, to the point of arm-twisting. And when they don’t take us up on our offer/favor/opportunity, we might get frustrated and annoyed. Now imagine the situation reversed. Usually, when someone offers me something like this, I appreciate their intentions. I try to stay open rather than squish their offer with a fast ‘no’. But eventually, I need to also be clear about how serious I am about following their suggestion(s). “On a scale of one-to-ten”…. What a nice way for all of us to get clear on what we really want! And on what we’re willing/not willing to do to get it. See? Sometimes crunching the numbers makes a great match! LESSONS FROM THE FUNNY PAGES: Big Dreams SHOULD Be Scary! No, I’m not running out of ideas for other ‘Lessons’ series I’ve started. It just seems like lately, lessons are everywhere! Today’s adage was, If your dreams don’t scare you, they’re not BIG ENOUGH. Yeah, yeah, I thought as I finished. Dream big. So trite. The things I’ve been worried about as I go to sleep at night, the things I worry about as I start my day… They all involve taking the next steps to rebuild my artist reputation out here on the west coast. They are all about starting over. Only this time, knowing how much time and energy that’s going to take. Even worse, they’re about worrying that this time, it’s not going to work. If I approach a gallery, and if they accept me, and I give them the best of my current work, I worry that I won’t have any more good ideas in me. If I sell an item online, I worry that the buyer, not having seen it in person, won’t like it. If I pitch a column to a new magazine (because I think I’m being slowly ‘let go’ from my current gig, and no one wants to tell me), I’m afraid I’m not good enough to get another gig. Part of me just wants to kick myself. ALL artists worry about running out of good ideas. ALL artists worry that, like Hollywood, we’re only as good as our last movie. Er…exhibit/show/column. ALL artists worry that somebody is going to be disappointed in our work. We need to learn those lessons over and over, practicing them, internalizing them–until our work habits are so solid, we finally learn to believe in ourselves. Til we know truly, in our hearts, that one setback will not break us. So I’m going to make an appointment to visit the gallery that’s expressed an interest in my work. I’m going to send a pic to a new customer who’s ordered from my online store, of the exact piece I’ve made for her. And I’m going to submit my images to a big art tour coming up this fall. If I fail? Well, there’s always another opportunity. There’s another chance next week, next month, next year. Sometimes, in order for a new door to open, an old one has to close. My goal is to replace “sample images” with individual images of each piece of jewelry. And hey–maybe I could start, like, today! 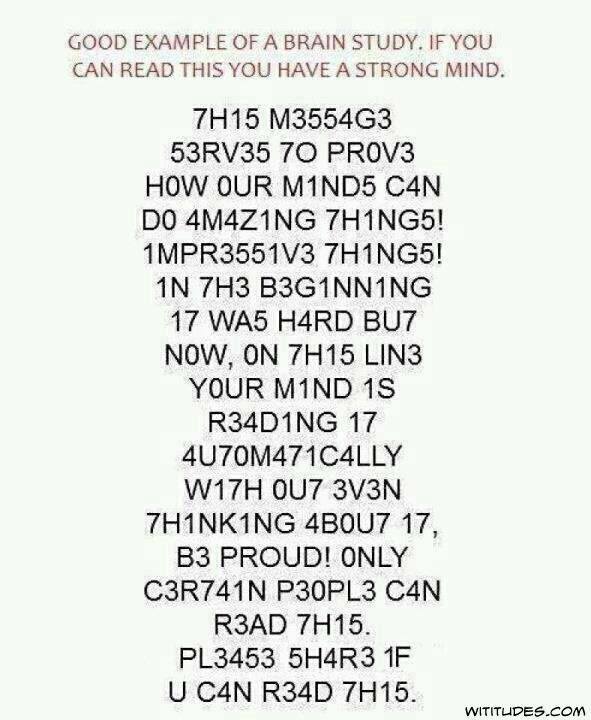 A sample ‘hard-to-read text” (NOT) as found on Facebook. And oh! Notice it spells ‘without’ wrong! Author Luann UdellPosted on April 20, 2015 April 20, 2015 Categories life lessonsTags how not to be afraid of success, lessons from the funny pages, setting worthwhile goals, the business of art1 Comment on LESSONS FROM THE FUNNY PAGES: Big Dreams SHOULD Be Scary! My column today at Fine Art Views, a marketing blog for artists and craftspeople. We make our own luck in the world. There are lessons to be learned everywhere, if we’re open to them. Today’s lesson from the gym is courtesy of a therapist there with an unusual hobby. This guy loves to go whale watching. When he found out I’m a recent transplant to the west coast, he suggested I check out the whale migration scene on the coast. We aren’t that far from Bodega Bay, where Alfred Hitchcock’s movie “The Birds” is set. There ARE a lot of birds out there, but so far, none have shown signs of turning on the human race….! Still, I’m careful to be very nice to all of them. Bodega Head is a beautiful stretch of land reaching out into the ocean to form one side of the Bay. Bodega Head, with its open vistas from towering cliffs, is a popular whale watching spot. Volunteer ‘docents’ are present on the weekends to offer advice and help with identification.Whales migrate south to feeding grounds off the coast Baja Mexico, then return north after the mating season. Mother whales travel more slowly, and closer to the coast, with their new offspring. This guy regularly reports back every Monday with exciting ‘spots’. And so my husband and I began making a trip every week or so to watch, too. We haven’t seen any whales yet–just seals, sea lions and pelicans. And of course, after our fourth attempt to spot a whale, my husband concluded that guy is “lucky” to have seen so many whales. Is he? Let’s dig a little deeper…. The whale watcher goes out every week he can, and sometimes multiple times in one week. He and his family stay for hours at a time–not an hour, or two at most, like we do. He knows a lot about whales, from talking with the docents and his own reading. He knows when they go, where they go, and why they go along our coast. He knows the best weather for watching, and the worst weather; and he knows how to get in-time local updates about that area’s weather. He knows what to look for–blowholes, pods, fins, breaches. He’s invested in a good camera and a great lens to capture good photos. So….Patience. Consistent effort. A practiced eye. And a passion for whales. Mostly, though, this guy makes his own luck. And he deserves every whale spot he gets. How many times have we heard about another artist’s success, envied their ‘luck’ and lamented our lack of same? Now think how often we trouble ourselves to find out what they did to achieve that. I’m guessing that ‘lucky’ artist is someone who’s practiced their craft with patience and persistence. I’d bet they have great images of their work, and a powerful personal story to go with it. I’d imagine they’re serious about getting their work out there, in a consistent fashion–through websites, shows, exhibitions, social media, getting published, personal invitations to collectors, and good selling skills. Above all, I know they’re truly focused and passionate about the work they create–enough to not only make time for it, but to make it a priority, as much as possible. Me? I would love to see a whale pod, or a mother and baby, or an orca, someday. But I’m just as happy to spend a few hours enjoying the beautiful California coast. I’m just as delighted to find a wonderful pebble or a twisty piece of driftwood on the beach. But when it comes to my artwork, I know the same qualities that make that guy a great whale watcher, makes me a competent artist. And when my next ‘lucky break’ comes, I’ll be ready!